The Buddenbrook clan is everything you’d expect of a nineteenth-century German merchant family – wealthy, esteemed, established. 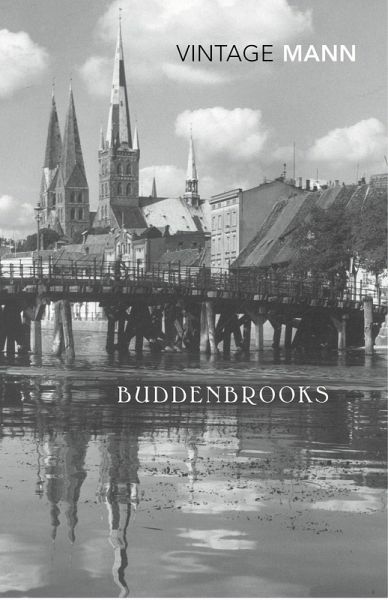 Four generations later, a tide of twentieth-century modernism has gradually disintegrated the bourgeois values on which the Buddenbrooks built their success. In this, Mann’s first novel, his astounding, semi-autobiographical family epic, he portrays the transition of genteel Germanic stability to a very modern uncertainty. Thomas Mann was born in 1875 in Lübeck, of a line of prosperous and influential merchants. Mann was educated under the discipline of North German schoolmasters before working for an insurance office aged nineteen. During this time he secretly wrote his first tale, Fallen, and shortly afterwards left the insurance office to study art and literature at the University in Munich. After a year in Rome he devoted himself exclusively to writing. He was only twenty-five when Buddenbrooks, his first major novel, was published. Before it was banned and burned by Hitler, it had sold over a million copies in Germany alone. His second great novel, The Magic Mountain, was published in 1924 and the first volume of his tetralogy Joseph and his Brothers in 1933. In 1929 he was awarded the Nobel Prize for literature. In 1933 Thomas Mann left Germany to live in Switzerland. Then, after several previous visits, in 1938 he settled in the United States where he wrote Doctor Faustus and The Holy Sinner. Among the honours he received in the USA was his appointment as a Fellow of the Library of Congress. He revisited his native country in 1949 and returned to Switzerland in 1952, where The Black Swan and Confessions of Felix Krull were written and where he died in 1955.